Posted on Sat, Feb 11, 2012 : 5:59 a.m. 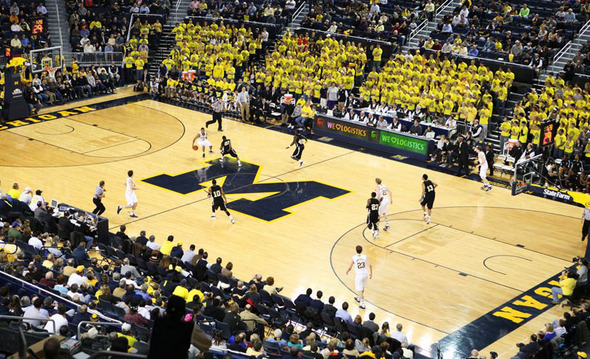 The Crisler Center has drawn big crowds this season and the Michigan basketball team is 13-0 in front of them. Crisler Arena was known for a lot of things when John Beilein took over the Michigan basketball program prior to the 2007-08 season. Being a difficult place to play was not on the list. Sellouts were seldom, the student section was far from intimidating and the Wolverines were nowhere near unbeatable in Ann Arbor. "One of our main goals this year was to protect home court," Michigan senior captain Zack Novak said. "We want to make sure that every time our fans came to see us play, they leave happy." So far this season, Novak and Michigan are a perfect 13-for-13 in both departments. Unbeaten at home this season, the 22nd-ranked Wolverines (18-7, 8-4 Big Ten) will look to hit 14-0 Sunday when Illinois visits the Crisler Center (1 p.m., CBS). The last time Michigan began a season 14-0 at home was 1985-86, which also happened to be the last time the Wolverines won a regular-season Big Ten title. Senior Zack Novak on the crowds at the Crisler Center: "There's been a couple times this year where it's been louder than any other time I've heard it in the past." With three home games left this season (Illinois on Sunday, Ohio State on Feb. 18 and Purdue on Feb. 25), Michigan has a shot at finishing the season with a perfect home record for the first time since 1976-77 -- also a Big Ten championship season. "The environment (at home) has been huge, there's people in the seats and that really gets us going," Novak said of Michigan's home-court edge. "People want to root for a team that's winning. "And when you're losing, especially on week nights, people have other stuff to do." Michigan has sold out five of its previous six home games, with the Jan. 11 game against Northwestern falling just 116 fans shy of six straight. Additionally, Michigan's total number of fans drawn so far this season (144,811) is already close to passing the total the Wolverines drew (150,504) for all of 2007-08, Beilein's debut campaign. That season, Crisler Arena held roughly 1,000 more people than the 12,721 fans the newly-renovated Crisler Center does today. That mark will surely get surpassed Sunday and, if numbers hold, Michigan should see sellouts the rest of the way. As of Friday, per StubHub.com, there were only 223 tickets left for the Illinois game, 248 for the Ohio State game and 565 for the Purdue game later this month. The last time Michigan listed more than five sellouts in a season was 1995-96. Should the Wolverines fill the building for their final three home contests, they'll have played in front of eight home sellouts -- the most since 12 in 1994-95, the final year a member of the Fab Five was on campus. 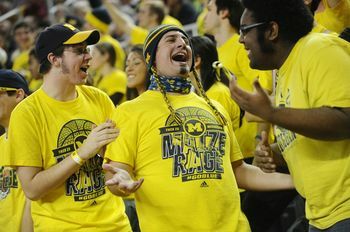 "We've had really good crowds (at home this season)," Beilein said. "To see it grow like that is a good thing. "And I know the accountants are probably happy about that, as well." The numbers are higher this season, but more importantly, so are the decibel levels. Novak said the general atmosphere and noise created by the home crowd has been louder this season than at any other point of his four-year career. "The fans have been great," he said. "The student section is much bigger, the Maize Rage has been awesome and it just seems like everyone's been really engaged. "There's been a couple times this year where it's been louder than any other time I've heard it in the past." More fans and more noise have directly led to more wins. The last two times a Michigan team was this tough at home, the Wolverines hung a banner at the end of the season. There are three home tilts remaining in 2011-12. And, yes, limited tickets are still available. Sun, Feb 12, 2012 : 2:32 a.m.
After our road record we better protect home court. Already down to 4th in big ten when you factor in overall record.